Encom provide a safe and healthy working environment for our staff and others who are affected by our work. 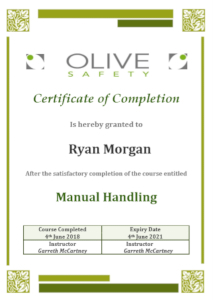 As a minimum standard, this is achieved by compliance with Irish and European Union directives and regulations in particular Safety, Health and Welfare at Work Act 2005. Encom also provide a high level of health and safety training for our staff to ensure their best welfare and best working practice on site. If you would like to view Encom’s health and safety statement or certification or if you require more information please contact us. Safe Pass Health and Safety Awareness Training: This training programme ensures that workers in construction have a basic knowledge of health and safety and are able to work on-site without being a risk to themselves or others who might be affected by their acts or omissions. All Encom staff have this required qualification. Mobile Elevating Work Platform and Harness Training (MEWP Certification): MEWP is an overall name for powered access platforms which can refer to any type of Mobile Elevating Work Platform / Cherry Picker. An MEWP operator course covers Scissor Lift and Self Propelled Boom and harness training. All Encom installation staff have this required qualification. 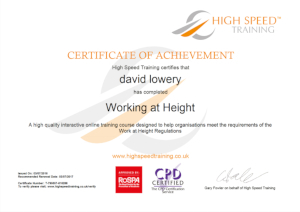 Working at Height Certification: Work at height is work in any place, including a place at, above or below ground level, where a person could be injured if they fell from that place. All Encom installation staff have this required qualification. Manual Handling: The Manual Handling training covers a range of topics in order to give the workers confidence to risk assess manual handling tasks and perform said tasks within their workplace. 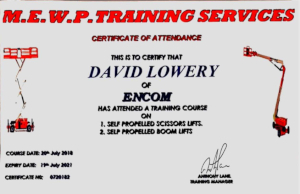 All Encom installation staff have this required qualification.